Kaveh Akbar is more of a shepherd than a wolf. The internationally acclaimed Iranian-American poet not only produces amazing thought-provoking poetry, but nurtures other poets to achieve their full potential too. So it was a perfect date for us to be hosting him at Tūranga, the flagship of the future. We are all about helping our citizens to access all they need to reach for the top. 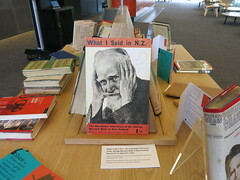 Hosted by local poet Erik Kennedy, this event was held in the brand spanking new Tautoru / TSB Space, and brought to us by WORD Christchurch in association with LitCrawl Wellington. View photos of Kaveh Akbar and Erik Kennedy event. Mr Akbar is a really nice guy. Humble and quietly spoken (though this changes when he reads) Kaveh kept thanking us for coming. When reading, Kaveh is animated, moving with the lilting rhythm of his words, his voice rising with the swell of emotion and experience. 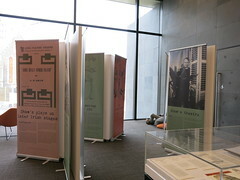 Binaries such as solitude and community, decay and rebirth, literature and culture. Kaveh has been posting interviews with poets making waves on DiveDapper; a website he created as a platform for exposure, promotion and connection. 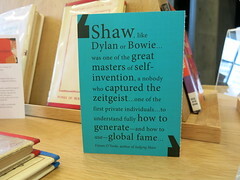 It has become a community, bringing poets and enthusiasts together worldwide. 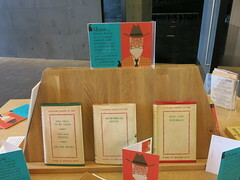 The list of poets on this website is impressive! Akbar sees this as a way to “push (his gratitude) outwards.” He further demonstrated this by reading two poems by New Zealand poet Helen Heath. 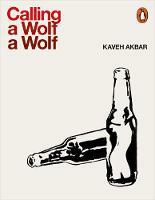 Kaveh’s book of poetry Calling a Wolf a Wolf was released to much acclaim this year. In it, Kaveh addresses difficult themes from addiction to desire; his poetry refreshing in a way that feels uplifting rather than downbeat. Akbar’s work shares a sense of lessons learned and experience shared, as opposed to a self-indulgent train wreck. In all, there is a theme of hunger: for the physical sensation of being alive. Akbar’s poems grabbed me at first taste. Alliteration, onomatopoeia and themes of life, death and longing fill his poems. Addiction is portrayed as a kind of death; “a void to fill in wellness”. The poetry came from a need to fill the gap left after he became sober: “my entire life up to that point was predicated on the pursuit of this or that narcotic experience.” All this brings to mind a Persian poet who celebrated the wine and song of life, yet without the cautionary tale: Omar Khayyam. In the light of current politics, Kaveh asserts that the ‘utility’ of poetry ‘forces us to slow down our metabolism of language’. A useful antidote to doublespeak, perhaps. He makes it sound like a science. And in fact it is. Although he now only speaks a few words of Farsi these days, Akbar sees feeling as a ‘universal language,’ one that we all understand. The purpose of poetry, he says, is as Homer put it – to ‘delight and instruct.’ So often, we leave out the delight, loving to lecture others on the way of things. Pre-sobriety, Akbar the poet painted himself as the hero of his works; a ‘gloriously misunderstood scumbag.’ A way of being, he says, that’s insufferable (I’ve dated guys like that). Do you speak Persian, in which he asserts that every drunk wants to die sober. with the whole world right here for the having. 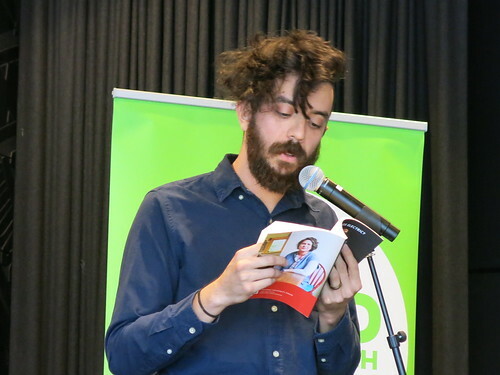 Come along to Tūranga on Tuesday 6.30pm to hear Iranian-American poet Kaveh Akbar read some of his award-winning works and chat with Christchurch poet and editor Erik Kennedy. 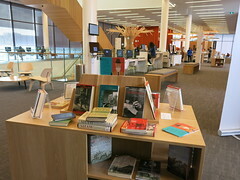 This event is proudly bought to you by WORD Christchurch, in association with LitCrawl Wellington. Tickets are $20 waged, and $15 unwaged (plus service fees). Buy tickets from Dash. Kaveh has won awards, and his poems have appeared in heaps of prestigious publications like The New Yorker, The New York Times, Best American Poetry 2018, and The Guardian. and slam poet Anis Mojgani (who many of you will remember from his previous visits to Christchurch, slaying us with his potent words). He believes that everyone should be reciting poems as they walk into a coffee shop, as they do the dishes, as they go on with their lives. The event will be followed by a book signing, with Scorpio Books will be selling copies of Kaveh’s book. There will be food and drink available for sale too. Photo by Hieu Minh Nguyen. Image supplied. Visit Kaveh Akbar’s website (it includes many of his poems online and some have audio too). 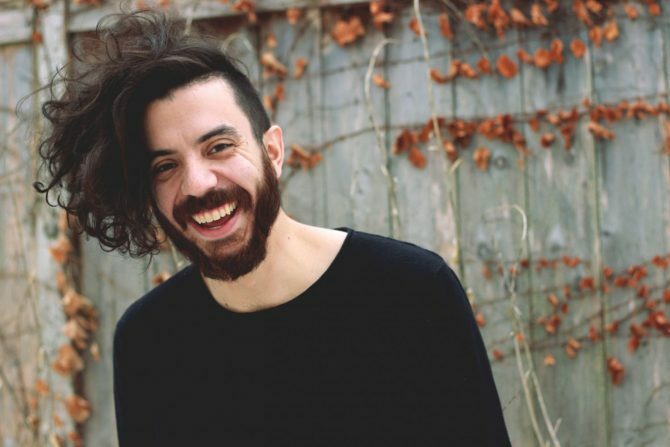 Read about Kaveh Akbar on the Poetry Foundation website. 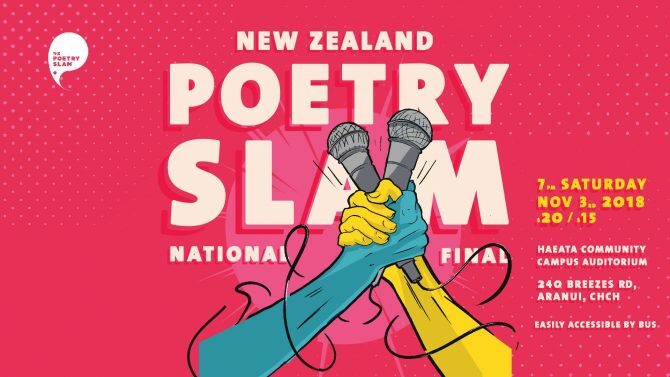 The New Zealand Poetry Slam national final is on this Saturday 3 November. It is the first time finals have been in the South Island. The nation’s best poets will compete in a literary showdown on Saturday, November 3rd in Christchurch. Poets representing Christchurch, Auckland, Wellington, Hamilton, Hawkes Bay, Dunedin, Nelson and Southern Lakes will perform in a three-round poetry slam as selected members from the audience will judge to determine the winner. Can Christchurch defend their title or will a new city take the crown? Featuring 2017 National Slam Champion, Christchurch’s own Daisy Lavea-Timo (DaisySpeaks), this is not a night to miss. Where: Haeata Community Campus, 240 Breezes Rd.